Take a listen to our #1 Song on Gospel Innovation!! ‘Help Me Find It’!! This is an amazing song that you MUST Purchase! “We love performing,” Dave Frey says simply and you get the impression that is the simple truth. “But we also love the people we perform for,” he adds, injecting a layer of complexity to the equation. 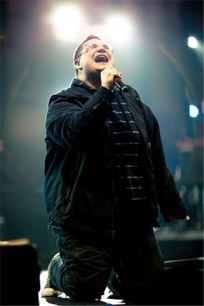 Integrating worship with real life – that is one of the simple truths Sidewalk Prophets has learned to live by. The two friends had no idea what was in store for them when their paths crossed at Anderson University eight years ago, but one listen to their hugely anticipated major label debut, These Simple Truths, confirms the band‟s undeniable talent. The fact that they have been on the road for 150+ dates per year for the past half-decade and show no signs of slowing down attests to their tenacious work ethic. But while there are tons of bands with talent and tenacity who never progress beyond the garage, Sidewalk Prophets insist it is the ever-present hand of the Lord that has lifted them to the next level of their career. Ben points to a demo he and Dave recorded while they were still in college that found its way, unbeknown to them, into a local campus recording contest. Giving them a shot to perform, their winning show put them on the radar of radio program directors and record labels. 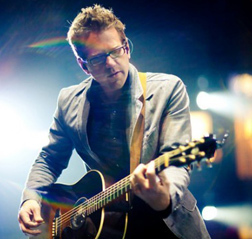 A chance encounter with Audio Adrenaline‟s Will McGinniss evolved into an opportunity for Dave to sing on the stage with Audio A in front of 20,000 screaming fans. Some cynics might chalk up these events to luck. Sidewalk Prophets view them as divine appointments. Then again, leaving family and friends to live on the road for half of each year, sleeping in the janitor‟s closet at some venues, and making due with beans and cornbread while constantly honing their triplet calling of songwriting, performing, and ministering to the kind of kids that never got picked first for kickball sounds like the „tenacious work ethic‟ needed to capitalize on those „divine appointments.‟ While the Prophets don‟t discount the value of approaching every show with the utmost professionalism, they are much more interested in the ministry value they will leave behind. “There was always a prevalent hope,” Ben says as the two friends relate stories from the road. There was the show where they played to an audience of three. And then there was the opportunity to join with dozens of their musical heroes on the stage of the Ryman Auditorium. There were all those times leading worship at church camps, and that special time in Germany serving at a missionary retreat. 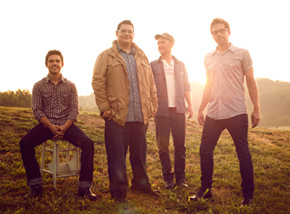 And the kids who feel left out, who relate to Sidewalk Prophets because they don‟t fit the „rock star‟ mold. “That‟s where our heart is, reaching out to those kids and letting them know they do matter,” Dave insists. A chance, or divine, encounter with a label exec led to an impromptu showcase at a local Christian school, and the rest, as they say, is history or perhaps history in the making. Although Ben and Dave had been writing together ever since their college days, they realize that sometimes three heads are better than two, so when the opportunity came to prep for their new album by co-writing with some of the top names in the industry they didn‟t hesitate for a moment. “The bottom line was, we wanted the best songs possible, and I think we got them,” Dave insists. To make those songs pop the band called on the talents of Dove Award winning Producer of the Year, Ian Eskelin (Stellar Kart, Francesca Battistelli, Sarah Reeves) to helm the project. These Simple Truths, the result of their collaboration, explodes from the speakers with sparkling pop, raucous rock, and beautiful ballads that will convince even the most jaded listener that these guys know how to craft intelligent, inspired music that fits comfortably inside the box, but may not be content to stay there. 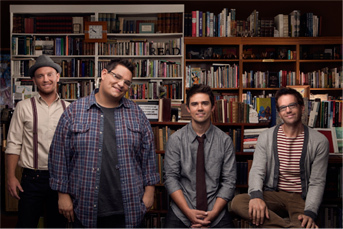 Sidewalk Prophets has a vision to help people young and old embrace the uniqueness God has given them. The more we look at a lot of today’s problems the more we see that a lot of times people are fearful of being themselves so they follow what the world tells them they should do. We believe that finding your identity in Christ is one of the most crucial steps in truly loving others. Once people start realizing this and living confidently in this we believe there will be a visible change in our households, our communities and ultimately our world.